Flower Cake. Nikon D700/28-300VR, 1/60s, f/8, ISO 3600, EV +0.3, 300mm focal length. 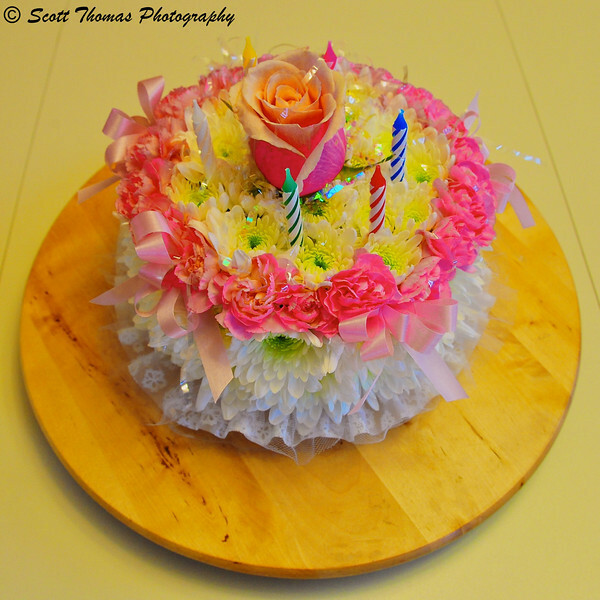 A birthday cake made up of flowers promises a guilt free celebration made up of roses, mums and daisies. Came complete with colorful candles, too. Here’s a look at the whole cake which was well received by the giftee. Pastel Flower Birthday Cake. Nikon D700/28-300VR, 1/60s, f/8, ISO 3200, EV +0.3, 28mm focal length. As you can see, the Nikon 28-300 f/3.5-5.6G ED AF-S VR Zoom lens came in handy. 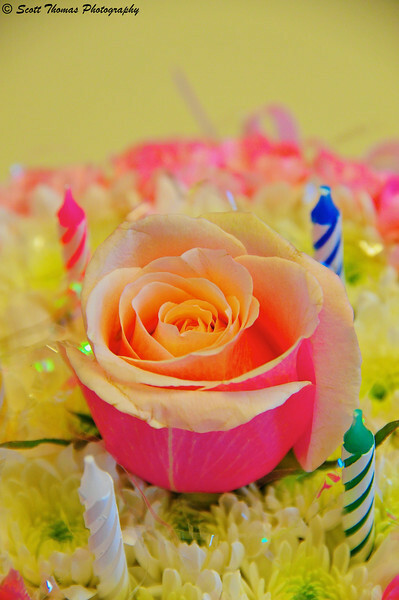 This entry was posted in People and tagged 28-300mm, birthday, cake, floral, flowers, gift, nikon D700, vr. Bookmark the permalink. Beautiful! Who is the lucky recipient? This was in celebration of my wife’s birthday. We later had a big seafood dinner with decadent desserts so we made for this not being a real cake. I bet that smells yummmmy! I’m with the other folks; can’t eat it, don’t want it. lol But it looks great.